“Back on the horizon line between Iyatunga and Titkana is a fine point that I am calling Phillips Mountain, in recognition of Donald Phillips, who made the ascent of Robson with Dr. Kinney,” wrote Charles Walcott on his 1912 trip to the Robson area. 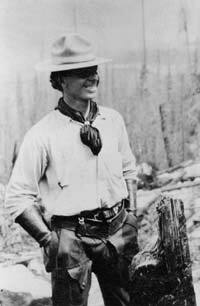 Donald (Curly) Phillips (1884-1938) was a Jasper guide and outfitter who accompanied George Kinney to within 50 feet of the top of Mount Robson in 1909. Phillips spent his youth in the Lake of the Bays district of Ontario, where he became an expert woodsman and master of white water craft. He was a member of the Guide’s Association of Ontario.He came to the Jasper region in 1909 to explore the country and start an outfitting and guiding business. He met George Kinney on the Athabasca River that year, when Kinney was looking for a partner to assault Mount Robson. Although Phillips had no mountain climbing experience, he joined Kinney, and they made several ascents around the end of July, finally reaching, on Friday, August 13, what Kinney claimed was the peak. Phillips later stated that the highest point had not been reached, and the first ascent of Mount Robson is credited to Conrad Kain, Albert MacCarthy. and William Foster . Phillips catered for the Alpine Club of Canada’s 1913 camp, during which William Foster, Albert McCarthy, and Conrad Kain made the first ascent of Mount Robson. Phillips built a causeway along the edge of the Robson River gorge, beside White Falls and the Falls of the Pool, which gave hikers and horses access to Berg Lake from the railway. He took Mary Jobe on her exploratory trip to Mount Sir Alexander in 1915 and later organized many canoe trips on the Peace and Mackenzie rivers. Phillips also catered for the second Mount Robson camp in 1924, for the Tonquin valley camp in 1926, and for the Maligne Lake camp in 1930, when he was handling tourist motor boat transportation on Medicine and Maligne lakes. He became the most renowned tourist guide of the region.